Phonics is one method we use to teach children how to read and write. It's all about sounds which are called ‘phonemes’. There are 44 phonemes in the English language, which we put together to form words. Some are represented by one letter, like 'h', and some by two or more, like 'sh' in ship and 'ear' in clear. The written representations are called ‘graphemes’ and some phonemes have more than one grapheme. For example, the underlined sound in treat and cheese is the same but it is spelt differently. What is even trickier is that some graphemes have more than one sound like in shook and soon. Children are taught the sounds first, then how to match them to letters, and finally how to use the letter sounds for reading and spelling. We follow the Letters and Sounds programme. Initially in Nursery, children's listening skills are developed through the use of music, environmental sounds and rhyme. In Reception, children are introduced to phonemes linked to the letters of the alphabet, as well as one way of spelling each of the other 16 phonemes used in the English language, such as 'igh' and 'ch'. Children are taught to blend or sound out phonics to read a variety of words and segment or break down the sounds in simple words for spelling. In Year 1, children learn more about the variety of ways in which each phoneme can be spelled and they also learn about the different pronunciations made by different letters or groups of letters, such as 'a' in 'ant' and 'was'. At the end of Year 1, children will be tested on their phonics knowledge, using a statutory national test featuring 20 real words and 20 pseudo-words. Parents will be informed if their children met the standard required for the test. From Year 2 onwards, children consolidate their phonics knowledge, learning when to apply different spelling rules as well as how to spell plurals and different verb tenses. Children who did not meet the standard of the phonics test in Year 1, will repeat the test at the end of Year 2. A selection of interactive games for all phonics phases. 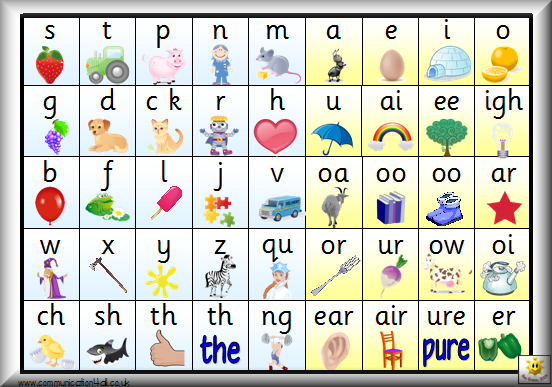 Printable resources for each of the Letters and Sounds phonics phases, also links to games aligned with each phase.